We have driven up to Greeley, where George’s 88-year-old father and his brother live. The only reason they live in Greeley is because of the University of Northern Colorado, which, when it was still Colorado State Teacher’s College, hired George Sr. to teach American history. He taught there for some 30 years; George got his undergraduate degree from this UNC because his father was on the faculty there. George was in 5th grade when they moved to the town; his brother Steve was 7 years old. Aside from the college, the town has what was once the world’s largest feeder lots, Montforts, which was the subject of Frederick Wiseman’s documentary on the meat industry. You can always tell when you are getting close to Greeley because of the smell of the feeder lots, which permeated the whole town; I think the lots must be much smaller than they were, but the smell is still here. The local paper reported this morning that the other big business in the region is Leprino Cheese, which is the biggest producer of mozzarella cheese in the world, using 5 million gallons of milk a DAY. One would think it might make Greeley relatively prosperous, but of course unions are not allowed in either of this industries, so workers aren’t paid enough to get out of the lower rungs. The streets have some substantial buildings and some nice houses, but it has never seemed more than a small agricultural town with a substantial Mexican population to me. 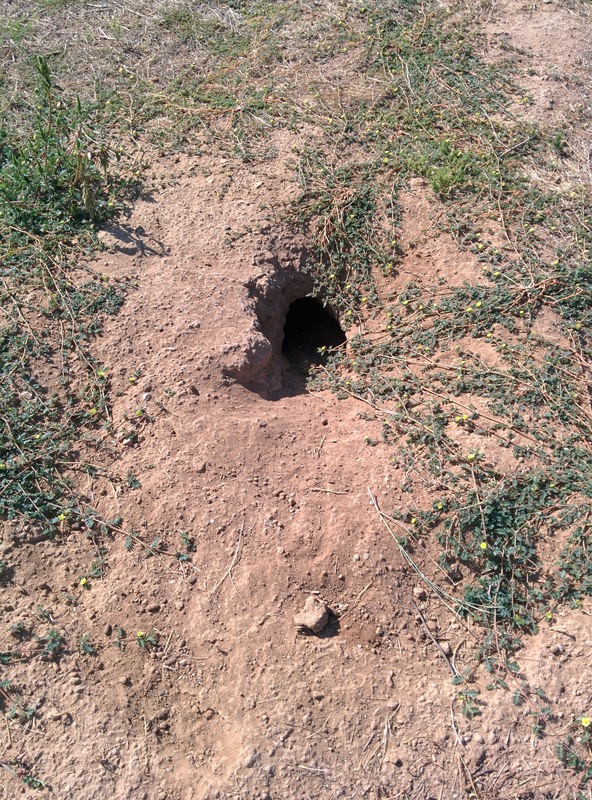 And also some great prairie dog towns, which are what those cryptic photos above are about. Love those critters! 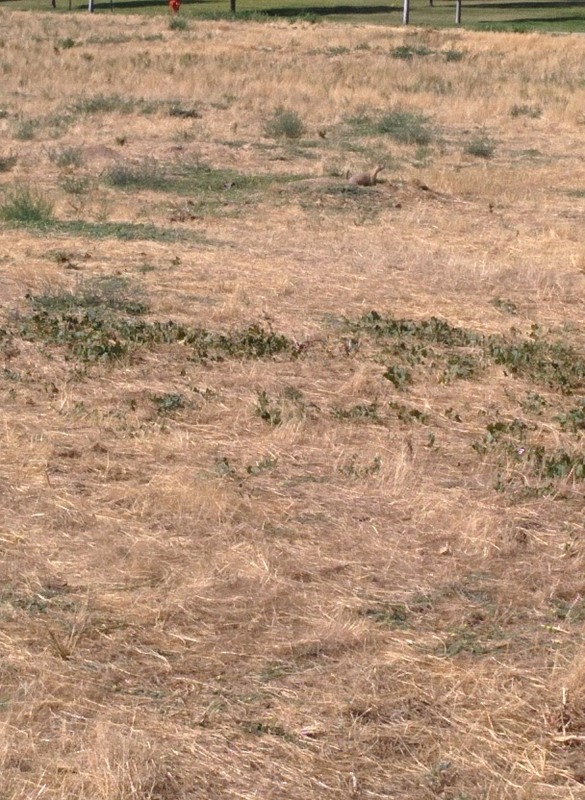 George’s father is now very frail and stooped over, but still insisting that he will not leave his three-story house, even though he has been falling, and won’t even use a cane. We all know where this is heading, don’t we? 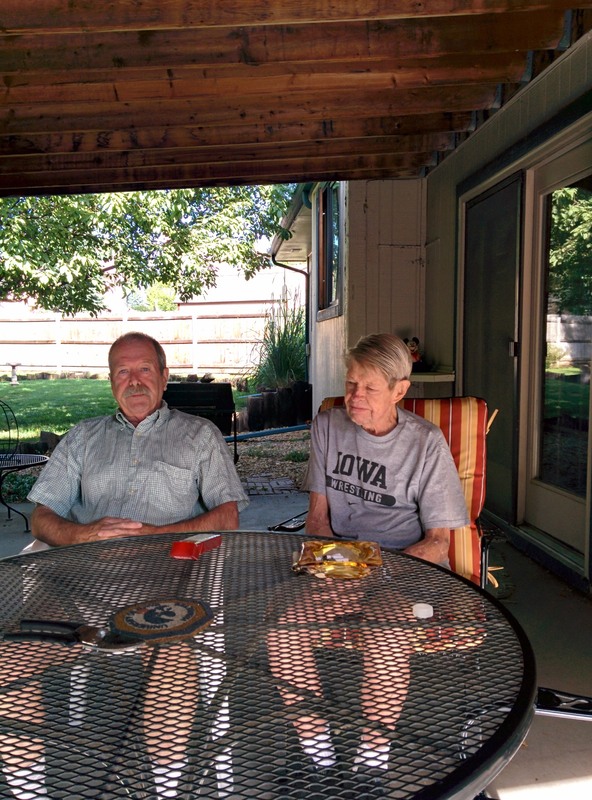 But it was good to see him, and listen to the same stories he has been telling us for the last 40 years, and sitting outside so we can avoid the chain smoking haze as much as we can. The same group of people come over that have been coming over for the last 40 years, and after George Sr. has had enough, he dismisses us abruptly, and we must leave as quickly as we can. He will follow us onto the street to make sure we’re gone. But he’s very happy to see Dottie and Max–especially Dottie, who, I think, reminds him of George’s mother, his first wife who died when George was 24; I never met her. This time we’re staying at Steve’s house, which is huge and always spotless. It is absolutely astonishing to me that two completely disparate personalities could have been raised in the same household. 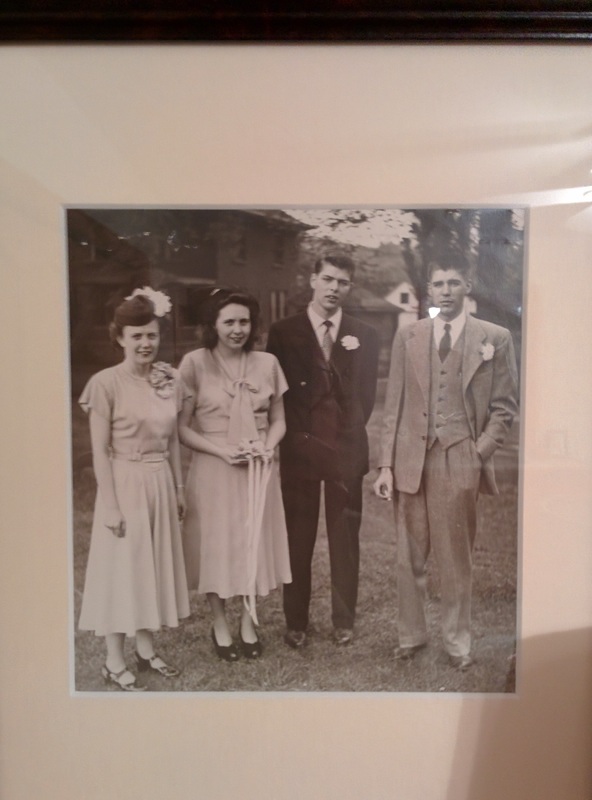 But here in one of the 5 bedrooms I found on the wall the only photo I have ever seen of their parents’ wedding–they were not much of a photo-taking family, and I haven’t seen more than two or three photos of their mother at all. But here they are, looking so young (they were 21), and so innocent. I wish I had known her, and I wish I had seen these photos before. I just spent a half hour writing a big long post about our return to Denver through the mountains after 40 years away, and pushing one wrong button, I have lost the whole story!!!! WORD PRESS, THIS IS A PROBLEM!!!! What can I recover? Let’s see, I mentioned that we passed the same mountain meadow pond where 40 years ago, we had watched a beaver doing beaverish things while we waited on the road as the mountainside was being blasted away to build the very road we were now driving on–this all seems metaphorical and somehow reassuring that nature is still there. We had strange sensations as old familiar names started appearing–ones we hadn’t thought about in years, but each one bringing up visual anecdotes. Memory is such a bizarre thing! After a very long drive, we finally made it to Max & Dottie’s house (the picture above is from their porch, from which you can see a sliver of mountains) . 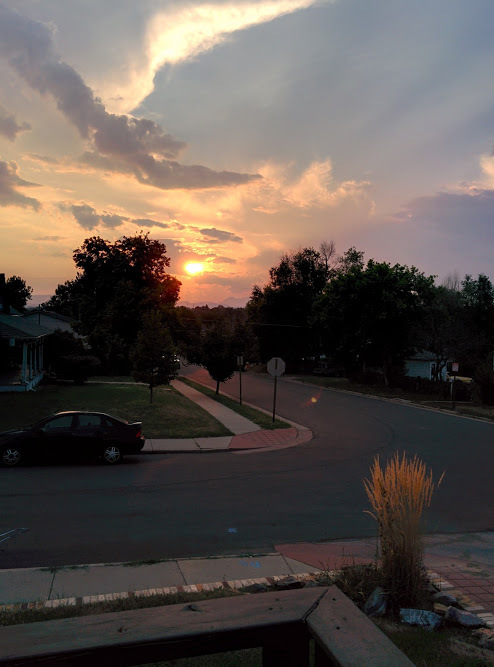 A working-class neighborhood, not very interesting but safe enough, but for the sake of reasonable rent, they have decided to stick it out until they can buy a house–Denver prices are disappointingly high. They are still recuperating from a long, stressful move, Max has just finished his first week of teaching while having a cold, pregnant Dottie has been searching for a job (now succesfully–nice to have a profession where one actually gets multiple offers and can negotiate for higher pay!). We’re exhausted, they’re exhausted, but we’re all going to be fine. We then had more blasts from the past, as we met with friends we hadn’t seen in 43 years–people who knew us when George & I first met at the University of Denver Library School–and spent an afternoon furiously chatting to catch up on our lives, and to recount silly old stories (like the time we made our first Thanksgiving dinner together, and got so drunk and stoned, we forgot to put in the turkey). We were then joined by other old friends, and were able to have these people meet for the first time–what fun! Tomorrow we go up to Greeley to see George’s 89-year-old father who does nothing but smoke, smoke, smoke, and read. I must be patient and remember that this could be one of the last times we see him. Now we’re sitting in Max’s house, listening to the crickets and the cat eating his kibble. Off to bed! What’s a bun boy? Dare I ask? Well, I am going to try to write something every day on this blog about our travels of the day, but it’s going to be a trick sometimes with all these connectivity issues along the way. We left Pasadena at about 11–we had to wait around for sheets to dry–but we made pretty good time in our packed to the gills car. Highlight of the day was a stop in the bleakest of landscapes right outside Las Vegas, in a little hole-in-the-wall town called Baker. Across the street from the Mad Greek Restaurant, festooned with Greek flags and garish plaster casts of Greek sculptures, was The Country Store, which I assumed would have only enormous bottles of Coke and beef jerky, but actually had gourmet sodas, including Bundaberg ginger beer from Australia. 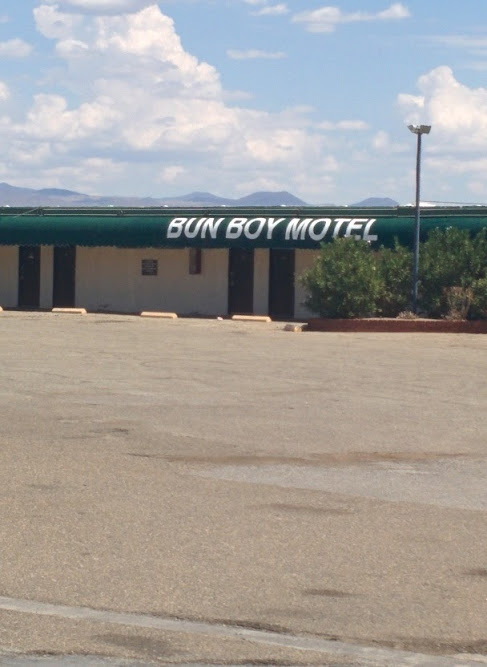 And then next to the store was this gem: The Bun Boy Motel, an utter dive whose name about which I do not want to even speculate. As soon as one crosses the border into Nevada at a place called Primm, the phantasmagoria of Vegas-style Disneylandesque architecture begins. What is with the turrets and fantasy facades for casinos set in the harshest of desert landscapes? Then there’s Vegas, of course. SURREAL is the only word to describe it. I assume it’s all about sensual visual overload. Is that it? I just do not get Vegas at all. 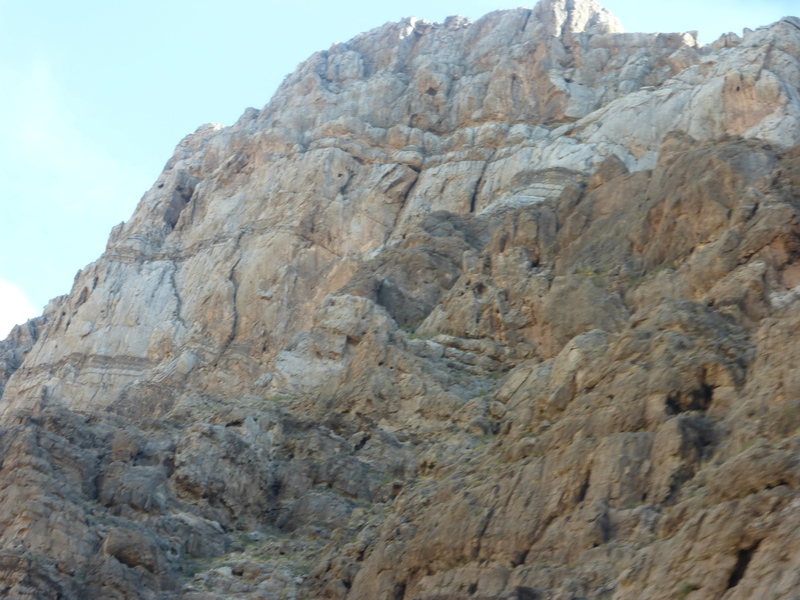 After driving through seemingly endless miles of scrub, one does a little slip across Arizona, on the other side of the mountains from the Grand Canyon, and the scenery starts to change, first going through a stupendous gorge with fantastic angles and light shining off of the craggy rocks. Then you’re in Utah, and increasingly red rocks and greener hills as one ascends. We ran into some startling lightning storms outside St. George, and by the time we got to Cedar City, it was positively cool and wet. We went from 105 in Baker, to 66 in Cedar City. Had a classic American diner meal, and now back in a noisy roadside Holiday Inn. On to Colorado tomorrow! As those of you who have listened to me whine about packing on Facebook know, I have been thrown into a panic at this point, overwhelmed by all the decisions we have had to make as we prepare to go to Europe for 9 months. Not only do we have to decide on what to take with us, but we also have to pack up a lot of the house to have it ready for our tenant. We then have to decide what goes in storage here, what personal memorabilia (family photos, etc.) to take up to my sister’s, what winter gear should be sent on ahead to Vienna, what summer things we need to keep out and take to Max & Dottie’s in Denver for our drive there and for our return trip–and finally, and most dismayingly, how to get ready to transport the cats up to my OTHER sister’s house where they will stay for the duration of our travels. I was fine with all the planning up to this point, but my mind just doesn’t get organized with this many factors involved, and when we have to make sure that EVERYTHING personal is cleared out of the house. It used to be so easy! You just got your passport in order, and threw a few things in a bag, and off you went! Now I almost need a separate bag just for medications and technology. We’re a little more high maintenance now: George needs a bed roll, because we can’t sleep easily in the same bed; I need my “special’ pillow or I can’t sleep well. And then look at this difference! 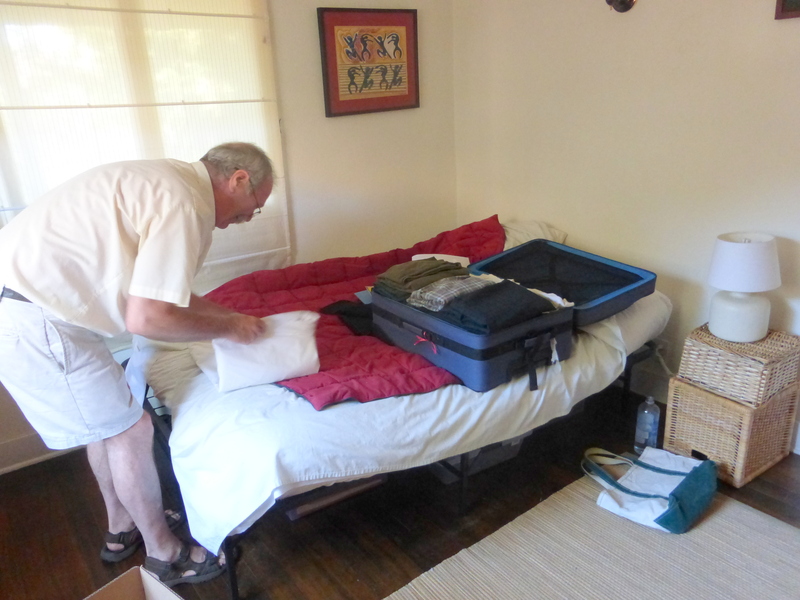 In the bottom photo, you see George’s entire packing–including a bed roll in the suitcase! 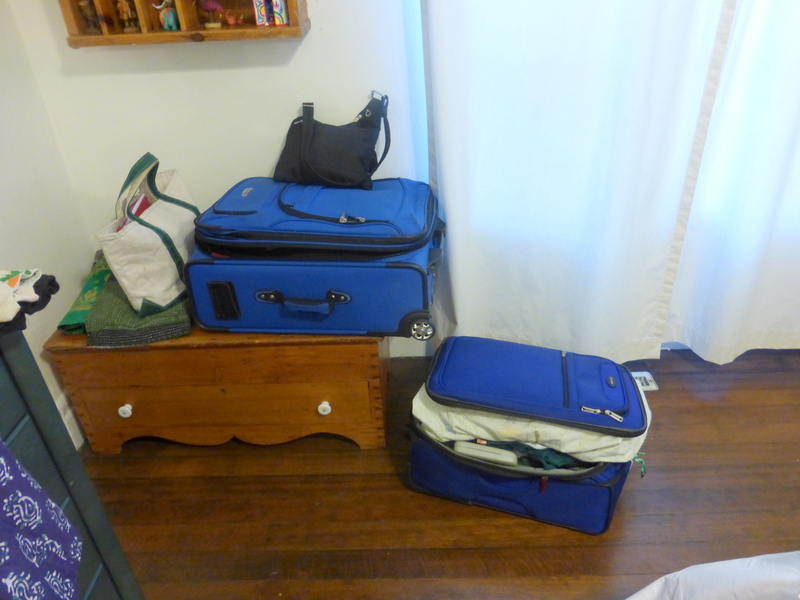 At the top is my entire haul, including my new Travelon anti-theft bag–which is way too small, but after having my passports stolen out of my bag on the tram in Vienna, I’m all for safety this time. Yes, yes, I know, I’m taking too many clothes, and probably not the right ones, but I don’t care at this point. I’ll let you know when I return how many things I never wore while we were there! I think I got more ramped up than normal because Max & Dottie have been starting their new life in Denver at the very same moment as we are getting ready to take off on our adventure. They have travelled across the country from North Carolina with Freddy the cat, and are now sitting in an empty house with nothing but a freaked-out cat and an air mattress to sleep on. Dottie’s pregnant, and doesn’t know anyone in Denver, and the house that they rented sight unseen may not be in the best of places for them. So I’m having some empathy panic, too. George, on the other hand, is very happy with the books he has hand made for the trip, to serve as his diaries! He’s so pleased with himself! We take the cats up to Krys on Thursday, stay at Robyn’s for two days, then come back for the final cleaning sprint, then head on out to drive to Denver. All will be well–especially once I hand over that boarding pass on our Icelandair flight to Rejkyavik and then London….